KUALA LUMPUR, Malaysia (AP) — Vietnamese air force planes on Saturday spotted two large oil slicks in the area where a Malaysia Airlines Boeing 777 vanished earlier in the day, the first sign that the aircraft carrying 239 people on board had crashed. A Vietnamese government statement said the slicks were spotted late Saturday off the southern tip of Vietnam and were each between 10 kilometers (6 miles) and 15 kilometers (9 miles) long. There was no confirmation that the slicks were related to the missing plane, but the statement said they were consistent with the kinds that would be produced by the two fuel tanks of a crashed jetliner. Relatives and friends of passengers were escorted into a private area at the Lido Hotel, and reporters were kept away. A man in a gray hooded sweatshirt later stormed out complaining about a lack of information. The man, who said he was a Beijing resident but declined to give his name, said he was anxious because his mother was on board the flight with a group of 10 tourists. The South China Sea is a tense region with competing territorial claims that have led to several low-level conflicts, particularly between China and the Philippines. That antipathy briefly faded as China, the Philippines, Vietnam, Singapore and Malaysia all sent ships and planes to the region. Thanh said Malaysian, Singaporean and Vietnamese search officials were coordinating operations in an 11,200-square-kilometer (4,324-square-mile) area where the plane was last known to be. He said Vietnamese fishermen in the area were asked to report any suspected sign of the missing plane. The air search was suspended for the night and was to resume Sunday morning, while the sea search was ongoing, the airline said. "Our team is currently calling the next of kin of passengers and crew. Focus of the airline is to work with the emergency responders and authorities and mobilize its full support," said Yahya, the airline CEO. "Our thoughts and prayers are with all affected passengers and crew and their family members." 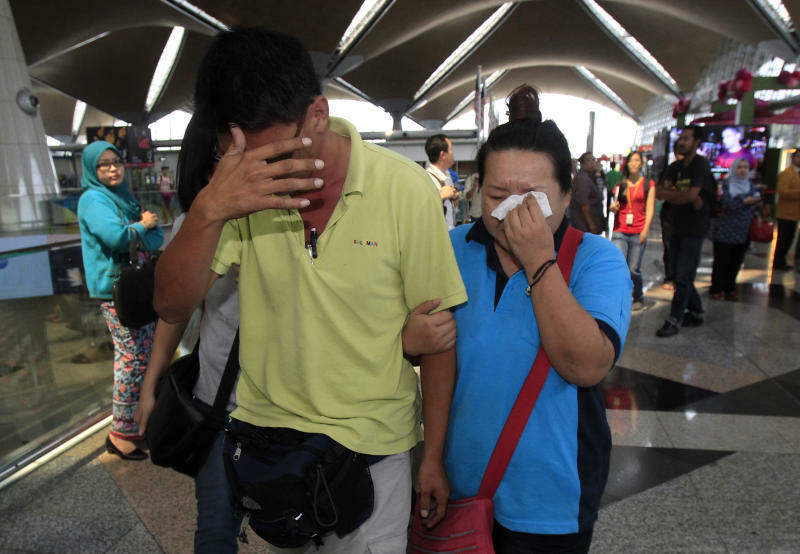 Fuad Sharuji, Malaysia Airlines' vice president of operations control, told CNN that the plane was flying at an altitude of 35,000 feet (10,670 meters) and that the pilots had reported no problem with the aircraft. Asked whether terrorism was suspected, Malaysian Transport Minister Hishammuddin Hussein said authorities had "no information, but we are looking at all possibilities."